Prof Makau Mutua advises Jubilee, "They have diverted attention for Dubai scandal to Joho. - Bana Kenya News, Real African Network Tubanane. 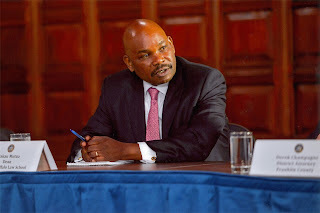 Home Gossip Prof Makau Mutua advises Jubilee, "They have diverted attention for Dubai scandal to Joho. Prof Makau Mutua advises Jubilee, "They have diverted attention for Dubai scandal to Joho. The government knows how to play tactics well. The Joho debate has diverted everything about the Dubai scandal. According to prof Makau Mutua, People have been swayed from very important issues affecting Kenya to an individual. The Government is fighting one person with all public resources forgetting that there are drought and price changes. Inflation is what people could think now. The opposition is busy retaliating government plans on elections while Kenyans are celebrating ethnically. Prof Mutua also added that there is a huge debt which Kenya needs to pay. Instead of looking for better ways to handle the calamity that is facing Kenyans, KNEC, Ministry of Education, NCIC, NIS, IEBC, NPS and the President are all focussing on Joho papers. The papers are not much to care as he already won and ruled Mombasa county for the Last five years, why now? The teargas used in Kwale, Allowance for the GSU and Vehicles used, all these are public resources. If the people of Mombasa are happy with the governor then there is no worry. Let them stay with their so-called "Academic Dwarf" Governor.